Take Route 28 South, towards Centreville, travel approximately 15 miles. Turn LEFT onto Compton Road. Continue for 2 miles and turn RIGHT onto BALMORAL GREENS AVENUE. The Club is 1/4 mile on the left. Take I-66 West approximately 20 minutes to Exit 55A (286 Fairfax County Parkway, SOUTH). Travel on the Parkway, South 2 miles to the 2nd Exit - Braddock Road WEST. Make a right turn onto Braddock Road and drive 2 1/2 miles, then turn LEFT onto Union Mill Road. Travel 2 miles to BALMORAL GREENS AVENUE. The Club will be down 1/4 mile on the left. Take I-95 South to I-495 West (Toward Silver Spring & Northern VA). Stay on I-495 to Virginia. Exit onto I-66 WEST. 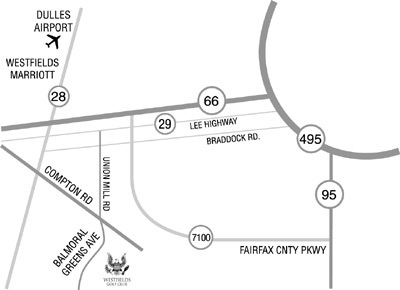 Travel approximately 15 miles to exit 55A (286 Fairfax County Parkway, South). Travel on the Parkway, South 2 miles to the 2nd Exit - Braddock Road WEST. Make a right turn onto Braddock Road and drive 2 1/2 miles, then turn LEFT onto Union Mill Road. Travel 2 miles to BALMORAL GREENS AVENUE. The Club will be down 1/4 mile on the left. Take I-95 North to Route 17 North (Fredericksburg). Continue North on Route 17 for approximately 25 miles. Take Route 28 NORTH towards Manassas. Follow 28 North for approximately 30 miles. Turn RIGHT onto Compton Road. Travel on Compton for 2 miles and turn RIGHT onto BALMORAL GREENS AVENUE. The Club is 1/4 mile on the Left.